We're pleased to announce that another new feature has been added to the plotaroute.com route planner. You can now make a route part of the background map, so that you can trace over it or compare it with another. This has been one of the most voted for Feature Requests, so we're delighted to be able to add it to the site. 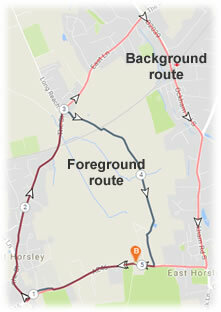 To trace over a route or compare it with another, select the route for editing in the route planner and click CLEAR. You'll then be given the option of leaving the current route in the background while you clear the map to plot a new one. You can send up to five routes to the background map in this way and they will all be shown in different colours, so that you can distinguish between them. Hi - thank you for this new feature! Is it possible to remove the background route after drawing the new route? I can't find the option to do that. I see that clicking "save" -> "save as new route" removes the old route. Problem solved! Thanks! Would be great to have this a feature in the tool box e.g. "display additional routes" and then getting a drop down list of your routes to choose from. A great feature like this should be more visible ;-). Anyhow, thanks for the great job!! Thanks Peder. The toolbox is getting a bit full but thanks for the suggestion, I can see this would be helpful - I'll have a think about how we could do this. You say that you can load up to 5 routes in the background, but I can't understand how to load the second of my routes without clearing the backgroud completely. Hi Peter - you can load additonal routes using the Uviversal Search box next to the menus.